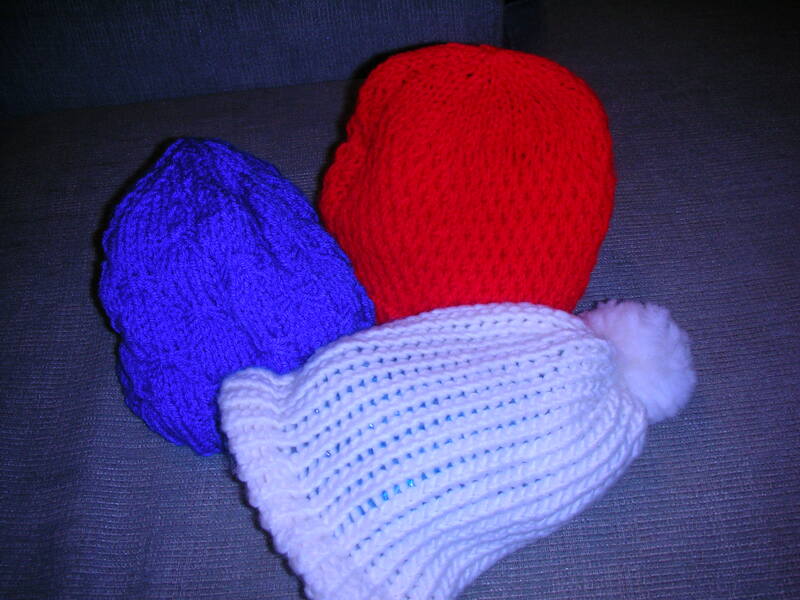 A salute to all of you knitting, crocheting or weaving hats for children at risk. You just have to ask and people are happy to step up and help. 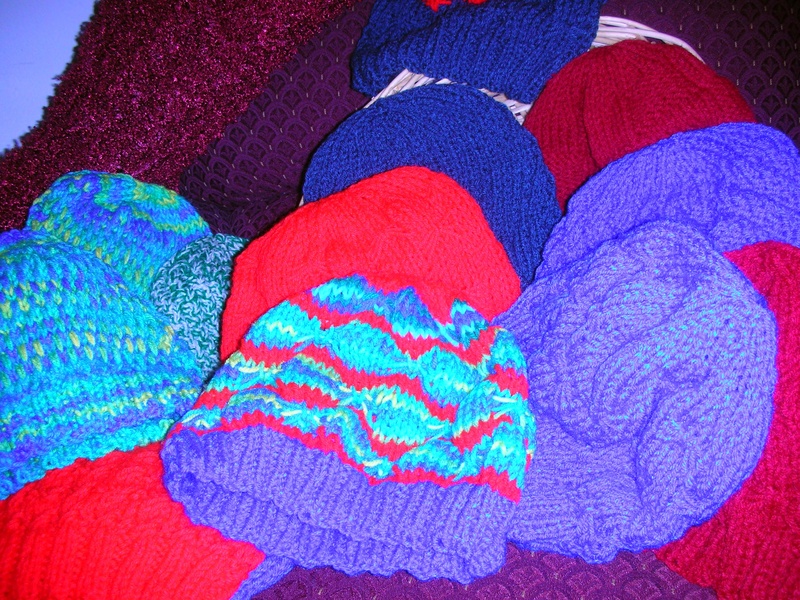 My Hats For A Purpose project got a real boost this week when the Northern Lake George Rotary Club presented me with twenty stunningly gorgeous hats for kids knitted by Rotarian spouse Cathie Burdick. The hats are in every color of the rainbow and every style imaginable. As I look at each one today I can see the talent it takes to create one of these works of art. But I can see something else. I can see the happy faces of these children at risk when they get to select a hat of their very own. An experience such as this builds self-worth and helps the kids understand that people care about them. Sometimes one act of kindness helps shapes the life of a child and is remembered for a lifetime. Cathie and the members of the Northern Lake George Rotary Club made a difference this week. Thank you for your generosity and compassion. A tip of the hat to the members of the Northern Lake George Rotary Club who are donating 20 hand knit winter hats for kids at risk for my Hats For A Purpose project. Each person who is knitting, crocheting, weaving or spreading the word about this project brings us closer to successfully completing this by October. This is a good way to do a little good in the world, make a child feel worthwhile and have fun too. Let me know if you can make a hat or two. Thanks everyone. I see Hannah as a young woman with deep faith in people, high ethical standards, the insight and strength to ignore the status quo and the stumbling blocks; a young woman who believes you can create an outcome that boosts entire communities out of poverty; empowers the women, educates the children. In other words she’s a CHANGEMAKER. I met Hannah last October at a Rotary Zone training in Rochester, NY. Her story amazed me, made me proud to be a Rotarian and cemented my belief that the Rotary Ambassadorial Scholar program puts the right people in the right place to positively impact global peace and understanding. When I first saw Hannah she was surrounded by the most beautiful and colorful fabric. Fabric that was woven into scarves, shawls and bags by the women weavers of Maheshwar, India. I listened in awe as Hannah told us how she first traveled there on a photo shoot to showcase their artistic talents and stayed to work with them to build an eco-friendly fair trade fashion organization called Jhoole (Ju-lay). As Hannah tells it, the women did not even own one of their sarees, had no understanding of the beauty of their art and were unable to find other work. I think Hannah’s first act tells you all you need to know about the kind of young woman she is: she gave the women $200 so they could weave and wear one of their own sarees for the first time. This investment led to further training, better wages and schooling for the children. Last fall, Rockford, Illinois’ Larson and Darby Group set out to design pro bono a eco-friendly, energy-neutral training center that will eventually train over 200 women. The center will house a nursery and other services so that the Jhoole women will have better and more productive lives. There is so much more to Hannah and the Jhoole story – not only are sarees, skirts and other fashionable products available but Jhoole is now a branch of Chetanya Sewa, a local NGO, whose programs support women’s development, elder care, health initiatives, as well as the advancement of art and fashion. Take a moment to learn more about Hannah and Jhoole.